The participation to political decision processes appears to be less and less appealing in the European Union, particularly among young people. Multiple reasons are contributing to such disaffection: lack of trust in institutions, unsatisfactory outcomes of elections, feeling of being unable to affect how the system works. A reduced participation may turn a democracy dysfunctional, and sometimes even dangerous. The goal of the workshop is to start an activity on the topic of democracy and participation. Such initiative is by its nature multidisciplinary, involving mathematics (the methods proposed by Condorcet and successively improved and enriched), computer science (providing the enabling platforms), social psychology (fundamental in identifying factors influencing involvement and participation to the political life), and political science. Biography: Virginia Dignum is an Associate Professor at the Faculty of Technology Policy and Management at TU Delft. She holds a PhD from the Utrecht University, in 2014. Previously, she worked for more than 12 years in consultancy and system development in the areas of expert systems and knowledge management. Her research focuses on value-sensitive design of intelligent systems and multi-agent organisations, focussing on the formalisation of moral and normative behaviours and social interactions. In 2006, she was awarded the prestigious Veni grant from NWO (Dutch Organization for Scientific Research) for her work on agent-based organizational frameworks. She has participated and reviewed several EU and national projects, is member of the reviewing boards for the main journals and conferences in AI and has chaired many international conferences and workshops. She has published more than 180 peer-reviewed papers and several books, yielding a h-index of 28. She is secretary of the International Foundation for Autonomous Agents and Multi-agent Systems (IFAAMAS), co-chair of the European Conference on Artificial Intelligence (ECAI2016), and member of the Executive Board of the IEEE initiative on Ethics of Autonomous Systems. Abstract: In this talk, I will discuss the idea of Massive Open Online Deliberation platforms (MOODS) and the challenges (technical, social legal and ethical) that online deliberation of large numbers of persons poses. MOODs as discussed here are structured online environments aimed at overcoming the problems associated with public debates and public decision making regarding controversial issues in conflict ridden and adversarial arena’s (e.g. international politics, international relations, diplomacy and the domain of the United Nations). MOODs do their work by tapping our individual understanding and opinions by harnessing open, participatory, crowd-sourced and wiki methodologies to effectively produce collective judgements regarding complex political and social issues in real time. MOODs aim to offer legitimate, shared, high quality input for political decision making by representing qualified opinions of large numbers of citizens regarding problems and conflicts that potentially have grave consequences and considerable cost. This platform support e-democracy by providing means to structure debates along two directions: (1) a method to differentiate and validate facts and opinions, and (2) a mechanism that maps both the social acceptance and the moral acceptability of debate outcomes. Biography: Giampiero Giacomello is Associate Professor of Political Science with the Department of Political and Social Sciences, University of Bologna, Italy. Previously he held research and teaching positions (visiting) at several American and European universities. His research interests include strategic theory, cybersecurity, and simulation techniques. He has authored and co-edited various volumes and published several articles in European Political Science, International Studies Review, European Security, Contemporary Politics, International Political Science Review and others. Dr. Giacomello has reported on "Italy" for the yearly publication Freedom of the Net (Freedom House) and is a contributor on defense and security issues for Italian dailies. Abstract: The talk will focus on the relationship between the much-awaited "E-democracy", in which voters will electronically cast their ballots, and the need to guarantee that the voting will be fair and unbiased. To do so, however, there might be high compliance costs and/or security policies that make e-voting too inaccessible or inappropriate or even "dangerous" for less wealthy or technologically-endowed democracies. Far from being limited to less-developed democracies, however, the case of Russia hackers recently breaking into the US Democratic Party election committee shows how widespread cyber-threats to the democratic process already are and how pressing is the need for viable solutions". Biography: Dirk Helbing is Professor of Computational Social Science at the Department of Humanities, Social and Political Sciences and affiliate of the Computer Science Department at ETH Zurich. He earned a PhD in physics and was Managing Director of the Institute of Transport & Economics at Dresden University of Technology in Germany. He is internationally known for his work on pedestrian crowds, vehicle traffic, and agent-based models of social systems. Furthermore, he coordinates the FuturICT Initiative (http://www.futurict.eu), which focuses on the understanding of techno-socio-economic systems, using smart data. His work is documented in hundreds of scientific articles, keynote lectures and media reports worldwide. Helbing is an elected member of the prestigious German Academy of Sciences "Leopoldina" and worked for the World Economic Forum’s Global Agenda Council on Complex Systems. He is also co-founder of the Physics of Socio-Economic Systems Division of the German Physical Society and of ETH Zurich’s Risk Center. In January 2014 Prof. Helbing received a honorary PhD from Delft University of Technology (TU Delft). Since June 2016 he is affiliate professor at the faculty of Technology, Policy and Management at TU Delft, where he leads the PhD school in "Engineering Social Technologies for a Responsible Digital Future". Abstract: Fridges, coffee machines, toothbrushes, phones and smart devices are all now equipped with communicating sensors. In ten years, 150 billion 'things' will connect with each other and with billions of people. The 'Internet of Things' will generate data volumes that double every 12 hours rather than every 12 months, as is the case now. Blinded by information, we need 'digital sunglasses'. Whoever builds the filters to monetize this information determines what we see — Google and Facebook, for example. Many choices that people consider their own are already determined by algorithms. Such remote control weakens responsible, self-determined decision-making and thus society too.The European Court of Justice's ruling on 6 October that countries and companies must comply with European data-protection laws when transferring data outside the European Union demonstrates that a new digital paradigm is overdue. To ensure that no government, company or person with sole control of digital filters can manipulate our decisions, we need information systems that are transparent, trustworthy and user-controlled. Each of us must be able to choose, modify and build our own tools for winnowing information. With this in mind, our research team at the Swiss Federal Institute of Technology in Zurich (ETH Zurich), alongside international partners, has started to create a distributed, privacy-preserving 'digital nervous system' called Nervousnet. Nervousnet uses the sensor networks that make up the Internet of Things, including those in smartphones, to measure the world around us and to build a collective 'data commons'. The many challenges ahead will be best solved using an open, participatory platform, an approach that has proved successful for projects such as Wikipedia and the open-source operating system Linux. Biography: Researcher at CNRS (French National Center of Scientific Research). With a background in Mathematics, Laslier obtained his PhD in Economics (cnam Paris) in 1991. His research interests include Mathematical Economics, Games and Social Choice Theory, and Political Science. His does research on democracy, and in particular on voting rules and voting behavior, from the formal and from the experimental point of view. He teaches at the Paris School of Economics and publishes articles in journals in the two fields: Economics and Political Science. He is the Chief-Editor of the journal Mathematical Social Sciences (Elsevier) and also edited the Handbook on Approval Voting (Springer). Abstract: This talk is a survey about what we learned from of experiments about how innovations in the field of voting are received. Different experimental methods are used (in the laboratory, on line and in situ) in order to tackle the following questions: Are people willing to engage in experiments in Politics? What kind of people like what kind of innovation? What are the cognitive, psychological or social barriers to innovation? Biography: Andreas Nitsche is a German entrepreneur and co-founder of LiquidFeedback. He is board member of the Public Software Group and the Association for Interactive Democracy in Berlin, Germany. Since 2005 he has been managing partner of an ICT company. From 1991 he worked for commercial and central banks as a specialist for transaction banking, international cash management and information technology for some 15 years. Nitsche is co-­author of the book "The Principles of LiquidFeedback" and co-editor of "The Liquid Democracy Journal on electronic participation, collective moderation, and voting systems". Nitsche has a degree in computer science. Abstract: The talk will describe the challenge of debates within large scale groups and how LiquidFeedback provides a self-organized opinion formation process without moderator intervention even when conflicts are present. It will explain how LiquidFeedback protects against the dominance of noisy minorities, hate speech and trolling, but at the same time makes sure minorities can express their point of view. The talk will also elaborate how LiquidFeedback can scale up to an unlimited number of participants by using transitive proxy voting and debate empowerment to allow a dynamic division of labor based on individual choice (sometimes referred to as Liquid Democracy). It will be shown how LiquidFeedback determines the voting options and avoids encouragement for tactical voting in order to find the unbiased collective preference. Special attention will be given to credibility and a wide range of use cases, such as political parties and civil society organizations but also civic and constituency participation. Biography: Danilo Pianini is a research fellow in Computer Engineering at University of Bologna. He received his PhD degree in Computer Engineering from the same university. His research focus is on coordinating large number of possibly situated devices, thus making them self-organising and self-adaptive. In particular the approach he is currently deepening is aggregate programming, where the focus lifts from the single device or agent to the global desired result, thus addressing the local-to-global issue often preventing the application of good engineering practices to the systems in study. The potential application scenarios include (but are not limited to) swarms of drones, smart cities, and Internet of things. Abstract: Digital technology and computer science are more and more widespread, and they are set to become a major player in the democratic process. Some valuable tools that allow for such decision process to happen already exist. However, several concerns typical of the engineering process remain apparently uncovered. For instance, in a classic software engineering process, one or more artifacts are produced in the analysis phase that represent a formal, possibly machine understandable, model of the domain. Looking at the most common e-democracy platforms, this step is seemingly missing, along with others that concur at building a solid engineering process. 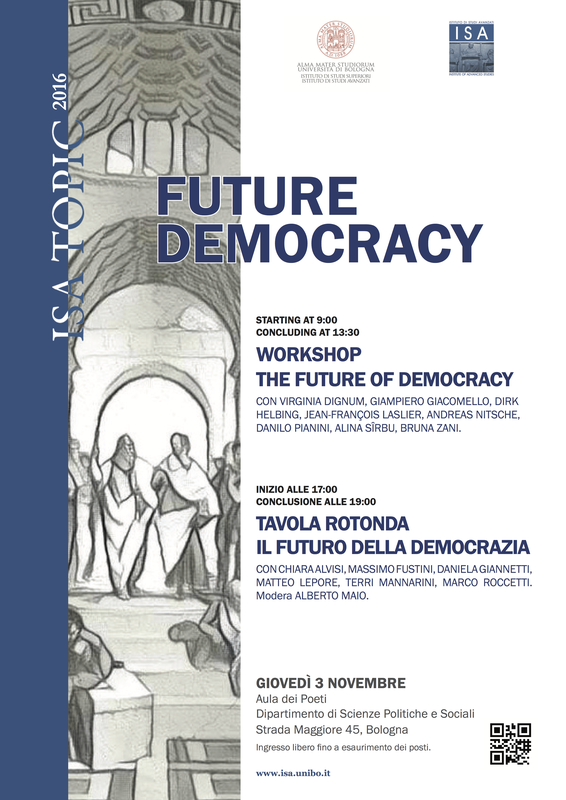 This talk arise questions (and provide no answers) about the current status of the e-democracy under a software engineering point of view: how can a democratic process get formally modeled? Is the democratic process shaping the tools we have, or viceversa? Is there a trade-off between transparency and security? And if so, how to determine which level of observability should the system allow? Biography: Alina Sîrbu is Assistant Professor of Computer Science at University of Pisa, and member of the Knowledge Discovery and Data Mining laboratory. She obtained her PhD in Computer Science from Dublin City University, Ireland, in 2011. Previous to her current position, she was Research Assistant at Bologna University, Visiting Assistant Professor at New York University, Shanghai, and Postdoctoral Researcher at the Institute for Scientific Interchange in Turin. Her research interests are Complex Systems Modelling, Data Science and Machine Learning, applied to a variety of systems ranging from social to biological and technical. Abstract: Winner selection by majority, in an election between two candidates, is the only rule compatible with democratic principles. Instead, when the candidates are three or more and the voters rank candidates in order of preference, there are no univocal criteria for the selection of the winning (consensus) ranking and the outcome is known to depend sensibly on the adopted rule. Building upon XVIII century Condorcet theory, whose idea was to maximize total voter satisfaction, we propose here the addition of a new basic principle (dimension) to guide the selection: satisfaction should be distributed among voters as equally as possible. With this new criterion we identify an optimal set of rankings (Pareto frontier). They range from the Condorcet solution to the one which is the most egalitarian with respect to the voters. We show that highly egalitarian rankings have the important property to be more stable with respect to fluctuations and that classical consensus rankings (Copeland, Tideman, Schulze) often turn out to be non optimal. The new dimension we have introduced provides, when used together with that of Condorcet, a clear classification of all the possible rankings. By increasing awareness in selecting a consensus ranking our method may lead to social choices which are more egalitarian compared to those achieved by presently available voting systems. Biography: Bruna Zani is full professor of Social and Community Psychology at Unibo. Previously she was Dean of the Faculty of Psychology (2002-2008) and Head of the School of Psychology and Education (2012-2015), University of Bologna. She is member of the Executive Committee of the European Community Psychology Association (ECPA) since 2006 and member of the Executive Council of EFPA (European Federation of Psychologists' Associations) since July 2015. Her research interests are on risk behaviours in adolescence; parent-adolescent relationships; risk perception and risk communication; service learning; civic engagement and political participation in adolescents and young people . On this latter topic she has edited a book with M. Barrett, Political and civic engagement. Multidisciplinary perspectives, Routledge, London, 2015. Abstract: The presence of young people as engaged active citizens in the political scenario seems declining in recent years all over Europe. Whereas many young people are disinterested in politics and political participation, others are active political actors involved in new patterns of engagement and actions of participation. What are the factors that lead some to be politically active and others not? 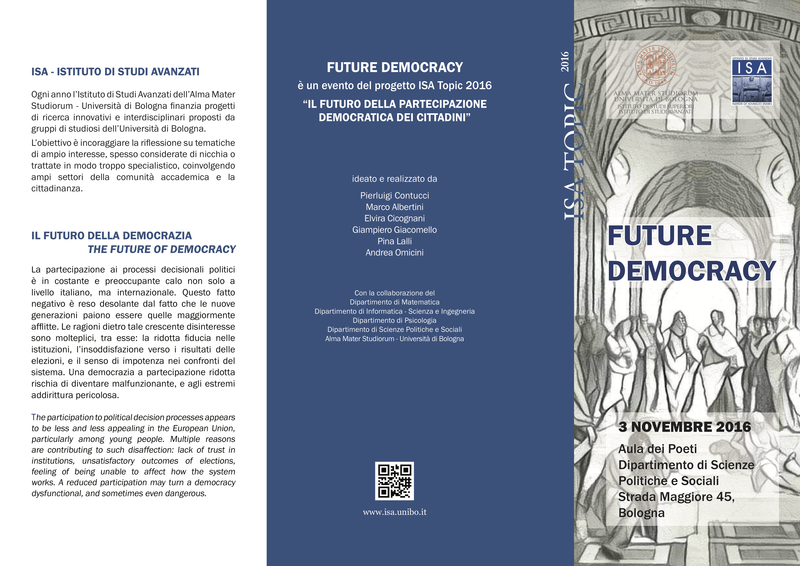 There are multiple reasons and motivations for this phenomenon according to the theoretical perspectives adopted by researchers, and it is crucial for the future of citizens’ democratic participation to understand the position that young people might take between apathy and participation. To provide answers to these questions, the talk will present some data from an international project funded by the European Commission under the 7FP, Processes Influencing Democratic Ownership and Participation (PIDOP), which involved 9 European countries. The main focus will be on the psychosocial factors and processes that facilitate and hinder youth’s political and civic engagement with particular attention to the new forms of participation and engagement youngsters adopt to have their voice heard at national and European levels. The issue of European dimension is now the core of a current H2020 project, Constructing AcTiveCitizensHip with European Youth: Policies, Practices, Challenges and Solutions (CATCH-EyoU), coordinated by Unibo, that has the aim to identify the factors, located at different levels (psychological, developmental, macro social and contextual) influencing the different forms of youth active engagement in Europe.